Late this fall I was cleaning my bathroom with some sort of noxious cleaner and I started to feel dizzy. Anyone who regularly cleans their house knows this feeling. I started to think, if it makes me feel like this, what could it possibly be doing to my children??? That was a couple of months, many hours of research and 1 shopping trip ago. As I walked into the house with gallons of white vinegar, pounds of baking soda and Borax, Colby questioned what sort of science experiment I was conducting. 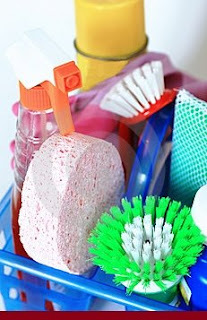 No science experiment, just safer, healthier, cheaper and more environmentally conscious cleaning habits. I have discovered the benefits of tea tree oil which is a natural antiseptic & fungicide. It has many uses from clearing up diaper rash to a sunburn reliever. It is a great ingredient to add as a disinfectant. I have switched over almost exclusively to all natural ingredients in everything from cleaning my toilets to my carpets. And, so far, I am very happy with the results. We spill at least one cup of coffee and one beer on our carpet every week, and with just some vinegar added to my steamer, it cleans just as well as the horrid smelling bottle of chemicals I used to use. I typically would have around 7 bottles of different cleaners in my house at any given time! Just think of how many chemicals that I have exposed my family to. Just think of all those plastic bottles that have ended up in a landfill! Yuck!!! Here is a quick cheat sheet on some of the things I have learned about cleaning 'au naturel'. Way safer. No toxic chemicals hanging around for children or animals to get into. Saves a lot of waste, not buying those plastic bottles over and over. Saves a lot of money, avoiding the advertising pressure and not filling your cart with unnecessary supplies. Put all the ingredients into a spray bottle, shake it up a bit. Combine the ingredients in a spray bottle and shake until the borax has dissolved. Apply and wipe off with a sponge or rag. Pour 1 cup of borax into the toilet before going to bed. In the morning, scrub and flush. For an extra-strength cleaner, add 1/4 cup vinegar to the borax. For disinfecting power, add a couple drops tea tree oil. To reduce the amount of laundry detergent you need to use, add baking soda or washing soda. These minerals soften the water, which increases the detergent's power. For liquid detergent, add 1/2 cup of soda at the beginning of the wash. For powdered detergent, add 1/2 cup of soda during the rinse cycle. Add about 1 cup vinegar to the reservoir, fill with hot water and add a few drops our favorite essential oil. You might smell the vinegar as you clean, but the smell quickly dissipates as it dries. To make, fill a 16 oz trigger spray bottle almost to the top with water. Use purified or distilled water for the best results. Add 3 Tbls of castile soap (or Palmolive) and 20-30 drops of tea tree oil to the water. Shake to mix. The only cleaner I have not figured a way to get away from is my laundry stain remover. With kids who constantly have grass stains, chocolate stains, etc... I need an effective way to get remove these. As I hand some of the clothes down through 3 girls, it is important to keep them looking as clean as possible. I have reconciled with myself that using that little stain stick & keeping all those clothes out of the landfill will have to be a wash. If you have found an effective, natural stain remover, please share it with me. I've gone vinegar on everything but laundry too. Dish soap gets out almost any food stain much better than commercial laundry stuff. (oh yeah, dish soap is still dish soap). hairspray gets ink and paint out. other than that, I'm at a loss. I'll try the glycerin too.